This is a family Authorized and Official website for selling A A Allen material. Find resources not available to the public in over 40 years! Affordable, exclusively available here. 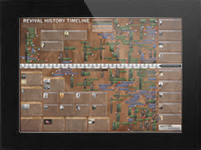 The Revival History Timeline poster is impacting every continent in 1,300+ homes, offices, churches and schools alike. Easily learn God’s works. Printed Edition now available worldwide. Voice of Healing Magazine chronicled the Healing revival of the late 40’s and 50’s. Including Oral Roberts, William Branham, A.A. Allen, T.L. Osborn and many more. During a 1959 Miracle Revival Meeting, God healed a young baby who received 26 creative miracles in probably the most notable healing service of A.A.Allens ministry.